The Diocese of Manchester was established in 1847, and Manchester Cathedral has since then stood as something of an oasis in the ancient heart of a bustling modern city. 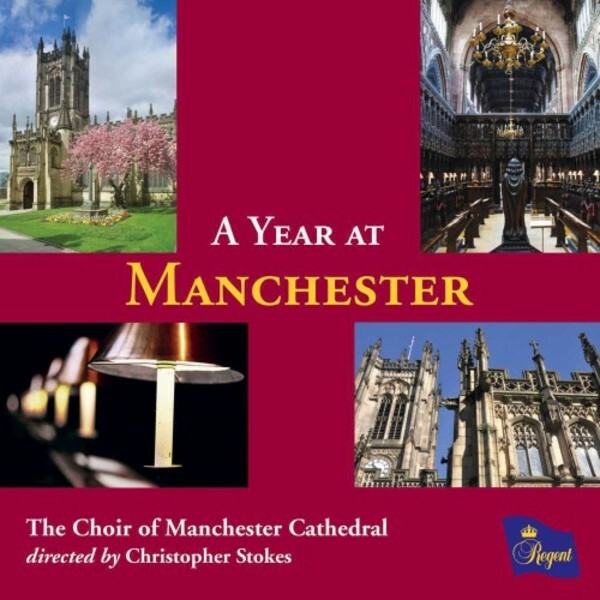 This recording, the seventh in Regent�s �A Year at� series, and the first from Manchester Cathedral Choir on the Regent label, documents some of the music performed during the year at the Cathedral, and covers the church�s year from its beginning in Advent to the Feast of Christ the King at the end of November. The wide-ranging and unusual programme covers music from the 16th to 21st centuries, and includes four first recordings of works written by the Cathedral�s Director of Music, Christopher Stokes, assistant organist Jeffrey Makinson and renowned local Manchester composer Sasha Johnson Manning. Manchester Cathedral Choir is unusual in being one of only two in the UK that has a treble line made up of both boys and girls aged between 8 and 14. The choristers are all educated at the famous Chethams Music School, which is next door to the Cathedral. The choir�s previous recordings on the Herald, Lammas and Naxos labels have all received outstanding reviews.